Still Life with Hat, Graphite. Still Life: Flowers in a Vase, 1992. Oil on Canvas, 14 x 14 inches. Collection, F. and C. Westendorp, Grand Rapids, Michigan. 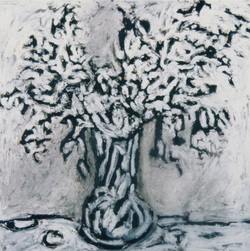 Still LIfe: Flowers in a White Vase, 1992. Oil on Canvas, 12 x 12 inches. Collection, Mark Duff, Minneapolis, Minnesota. Still Life: Sunflowers, 1990. Oil Pastel on Rag Board, 27 1/2 x 20 inches. Collection, Jayne and Gene Holland, Chicago, Ill. 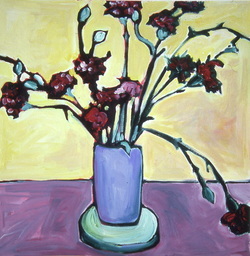 Still Life: Peonies II, 1990. Oil Pastel on Rag Board, 19 1/2 x 16 inches. Collection, Jayne and Gene Holland, Chicago, Ill. Flower Skeleton, 1992. Oil on Masonite, 48 x 48 inches. Collection, Steve Muke, Grand Rapids, Michigan. Still Life, 1992. Oil and Cement Dust on Canvas, 48 x 48 inches. Collection, Mike and Karen Clift, Sheridan, Wyoming. Fading Tulips, 1991. Oil Pastel on Rag Board, 32 x 16 inches, Collection, Krista Westendorp, Minneapolis, Minnesota. 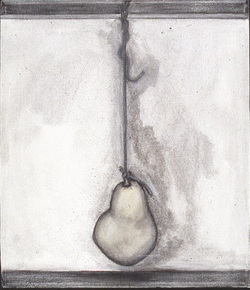 Suspended Pear, 1993. Oil on Canvas, 12 x 12 inches. Collection, Mike and Karen Clift, Sheridan, Wyoming. Untitled, 1996. Mixed Media with White Stone. c. 6 x 8 in. Untitled, 1996. Mixed Media with Cone. 40 3/8 x 12 5/8 in. Untitled, 1994. Mixed Media with Petrified Wood, 57 x 18 1/4 in. Untitled, 1996. Mixed Media, 37 3/4 x 14 in. Untitled, 1997. Mixed Media, 40 1/4 x 40 1/4 in. The Suspended Series is an investigation into the challenge of presenting a single object in such a way as to see it best. To place an object on a table is to limit its visibility. In suspending things I found I could contemplate them in a new way in terms of an otherwise invisible gesture. It also activated the picture plane in ways that were surprising and gratifying. These images led directly to the Stone Poem series. Ode to Yoko, 1995. Mixed Media with White Spruce Cone, 36 x 36 in. A Gift from Kay, 1996. Mixed Media with Redwood Cone. 44 1/2 x 41 3/4 in. Untitled Box with Hemlock Cone, 1998. 4 1/4 x 3 1/4 x 2 1/4 in. (Closed). Untitled Box with Stone and Feather, 1998. 7 1/2 x 4 x 3 3/8 in. (Closed). Meditation Box, 1998. Mixed Media, 14 3/4 x 9 3/4 x 6 3/4. Boxed Stick, 1998. MIxed Media, 13 3/8 x 7 7/8 x 4 1/2 in. Twelve Easter Sisters, 1998. Untitled Found Box with 12 White Spruce Cones. Collection, Monastery of St. Clare, Bloomington, Minnesota.